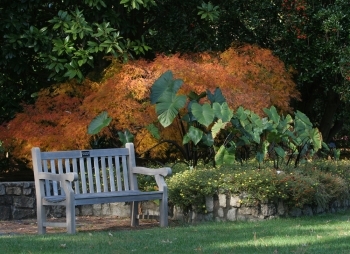 The beauty, wonder & serenity of Norfolk Botanical Garden combine to create a perfect setting in which to honor a loved one or pay tribute to a special friend. Choose from a number of beautiful locations in the Garden to place your teak bench. An accompanying commemorative plaque will hold up to 4 lines of text. This naming opportunity offers a number of different locations to choose from for a $10,000-$100,000 donation. Please call the Development Office at 757-441-5830 ext. 319 to make an appointment or email Cathy Fitzgerald.